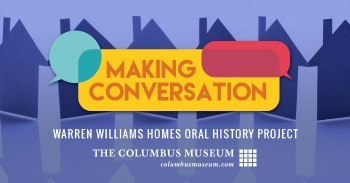 Oral history interviews are one-on-one interviews between a project team member and a member of the Warren Williams community. These interviews capture stories of what it means to live in the Warren Williams community. These will form the basis of an exhibit at the Columbus Museum. Resident dinners are a time for project volunteers to come together with Warren Williams residents over a meal to talk about Making Conversation. Dinners include special programming that tie into the theme of the project. Community art initiatives gives community members an opportunity to participate in art activities hosted by The Columbus Museum. The public art installation will be a permanent symbol of Making Conversation. It will be inspired by resident's stories.